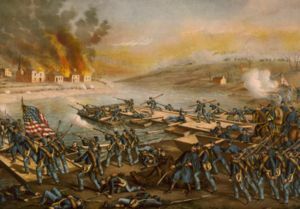 American Civil War, December 1862: Major General Ambrose Burnside, in command of the Union Army of the Potomac, sent troops to occupy the vicinity of Fredericksburg. General Robert E. Lee reacted by entrenching the Confederate Army of Northern Virginia on the heights behind the town. Burnside originally planned to cross the Rappahannock River 10 miles downstream from the town of Fredericksburg, but Confederate troops arrived there and blocked him. So he decided to cross directly at Fredericksburg. 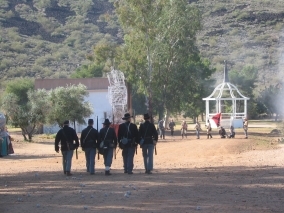 On December 12th, the Federal army went over the river and through the town. Over the next couple of days, Burnside mounted a series of assaults on Prospect Hill and Marye’s Heights which proved futile. Consequently, Burnside called off the offensive on December 15 and retreated across the river, ending the campaign and resulting in a Confederate victory. 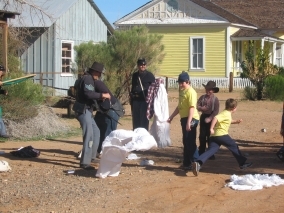 Several families in our homeschool group stepped back in time to the day when the Union Army attacked the town of Fredericksburg in December 1862. The boys in particular really got into it and had a blast! 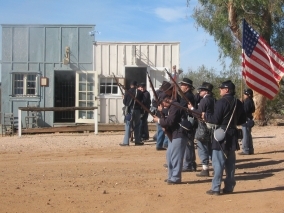 The Battle of Fredericksburg re-enactment took place at Pioneer Village, Arizona‘s most historically accurate living history site, with 90 acres located off I-17 just south of Anthem. Considering all of the unusually rainy weekends we’ve had lately, we were lucky that it was a beautiful clear winter day. 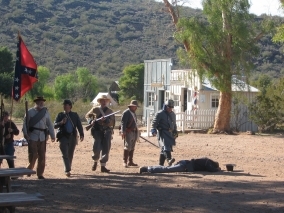 The re-enactors said that it was perfect weather for wearing their wool uniforms – but even so, they still got hot marching out there under the bright desert sun! We arrived at 9:00 am when the gates opened and that gave us plenty of time to visit the Union soldiers’ camp before the fighting began. 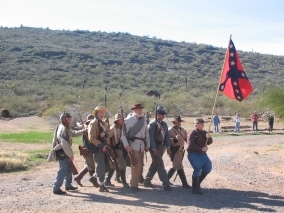 Both Union and Confederate re-enactors are a great bunch of guys, eager to offer information and answer questions. 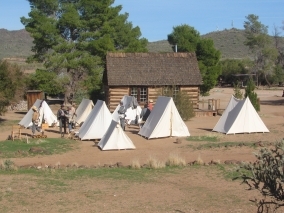 A Civil War Encampment, where soldiers slept in canvas tents. 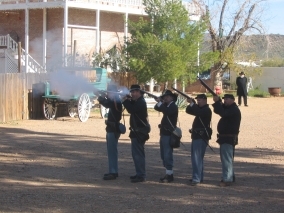 The troops would practice loading their weapons, attaching bayonets, and performing various maneuvers. 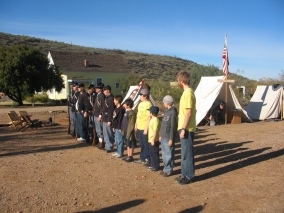 The boys in our group lined up to drill with the soldiers. 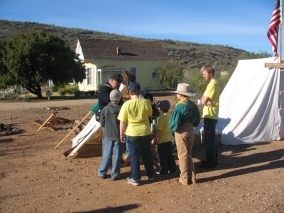 Live demonstrations focused on Weapons, Cooking, and Camp Life. 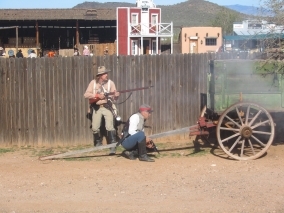 The kids rolled paper ammo cartridges, got to hold a gun (the average musket weighs 8-9 pounds), and ate a piece of hardtack (a flour-and-water biscuit, which in those days often became infested with weevils and maggots). 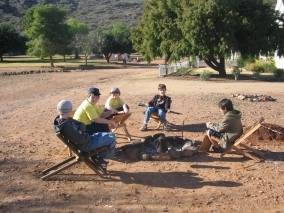 Relaxing around the campfire. When not drilling, standing guard, or faced with the sheer terror of battle, soldiers would spend their spare time reading, writing letters to loved ones, playing cards and other games. Union troops getting ready for action. It was a great honor to be the flag bearer and when a flag bearer fell in battle, someone else would leap forward to take his place. But their mortality rate was quite high since the goal of the opposing force was to seize the enemies’ colors. The Union Troops Advance Through Fredericksburg! Confederate citizens either went into hiding, ran away, or prepared to defend their homes and businesses as the Union army invaded their town. Union soldiers ransacked the town (and got back at the boys who had pelted them with “rocks” by throwing ladies’ clothing at them). 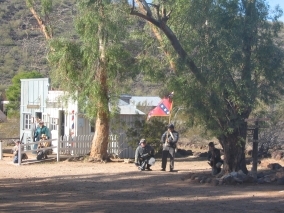 Union troops gathering in front of the bank. Hanging out at the Sheriff’s Office. The Union Army’s orders were: “Push a column of a division or more along the Plank and Telegraph roads, with a view to seizing the heights in the rear of the town.” In the battle of Marye’s Heights, Union troops tried to take the hill, but the Confederates were already entrenched behind a stone wall. Casualties lying in the street. The Confederates are victorious, and the Union Army retreats. The actual battles lasted from approximately 10:30 – 2:30 with a lunch break in between. 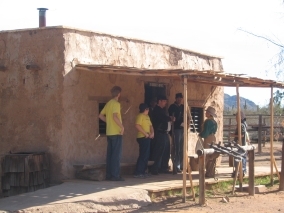 We stayed for a while afterwards to wander around and chat with the Confederate soldiers, then left at 3:00 pm although we could have stayed until 5:00. 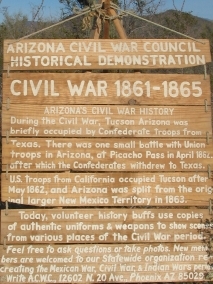 This event was sponsored by the Arizona Civil War Council, Inc. 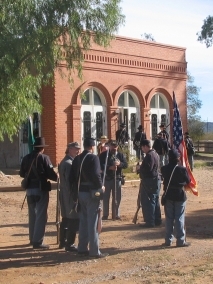 The Arizona Civil War Council (ACWC) is a non-profit association of volunteer history enthusiasts who re-enact events of the Civil War and Arizona‘s Territorial Period. 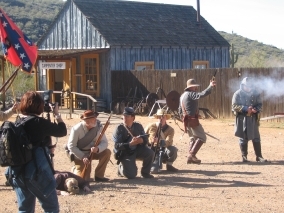 WANTED: ARIZONA VOLUNTEER REENACTORS: No experience is needed and gun NOT required. Instructions will be given on making or buying uniforms, men’s civilian clothes, and costumes for ladies and children. 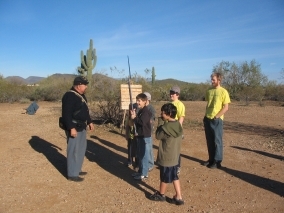 You must be over 16 to use any weapons; under 16 may be drummers, flag bearers, or cannon-assistants IF accompanied by a parent. Dues are about $20/year to cover liability insurance. 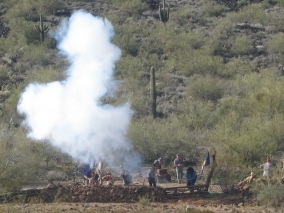 Visit their website at http://www.arizonacivilwarcouncilinc.com/ for more information. Did you know…? Gods & Generals (the prequel to the hit movie Gettysburg) showed the Battle of Fredericksburg with its street fighting scenes. In fact, one of the re-enactors on the Confederate side with whom we were talking afterwards explained how he actually played a major role in the movie Gettysburg, as well as Glory. 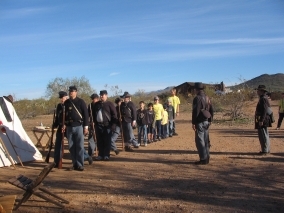 http://www.nps.gov/archive/gett/soldierlife/cwarmy.htm – What was life as a Civil War soldier like? Get more details in this fascinating article from Gettysburg National Military Park. 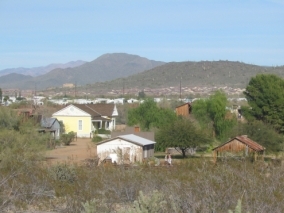 This site is a project of: Arizona owned/operated.